SCOTTSDALE, Ariz. – Jan. 16, 2018 – The Barrett-Jackson Scottsdale auction is poised for a historic “Super Saturday” this weekend as some of the most high-profile vehicles are scheduled to cross the auction block. Viewers at home can catch all of the heart-pounding action beginning at 1:00 p.m. MST on Velocity, and then during a special, unprecedented six-hour simulcast on Discovery Channel and Velocity from 4:00 p.m. – 10:00 p.m. MST. Among the highlight vehicles included in Saturday’s simulcast are four high-profile charity vehicles. Also on the docket for Saturday is a 1951 Talbot Lago T-26 Grand Sport Saoutchik Coupe (Lot #1381), 1952 Ferrari 212 Europa (Lot #1378) and 21 vehicles from the Steve Todhunter Collection that include some of the most sought-after supercars in the world today. 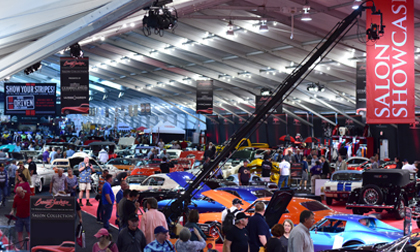 The 2018 Scottsdale Auction docket is now available to view online, along with the full television schedule on Discovery Communications networks around the world. Visit Barrett-Jackson.com/Bid for information on becoming a bidder or register onsite at WestWorld of Scottsdale. Tickets are available at the gate and ticket information is available at Barrett-Jackson.com. Also, follow Barrett-Jackson on Facebook, Instagram, LinkedIn and Twitter for the latest news and information from the 2018 Scottsdale Auction.